Фронтальный разрез через наружный слуховой проход. 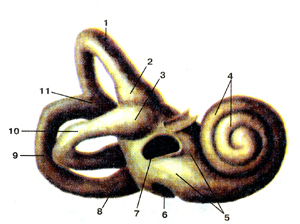 I -auricula; 2-meatus acusticus externus; 3-membrana tympani; 4-cavitas tympanica; 5-malleus; 6-ncus; 7-stapes; 8-vestibulum; 9-cochlea; 10-n. vestibulo-cochlearis; 11-tuba auditiva. 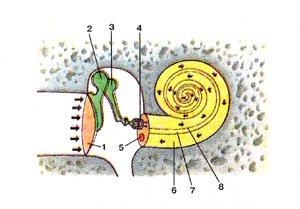 I-auricle; 2-extemal acoustic meatus; 3-tympanic membrane; 4-tympanic cavity; 5-malleus; 6-incus; 7-stapes; 8-vestibule; 9-cochlea; 10 vestubulocochlear nerve; 11-auditory tube. Рис. 391. Костный лабиринт (labyrinthus osseus) внутреннего уха правый. Вид сбоку и спереди. Fig. 392. 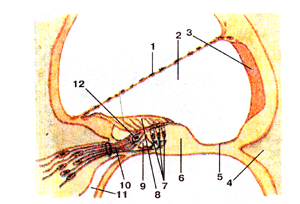 Scheme of relationship between bony labyrinth and membranous labyrinth, locating within the bony one. Membranous labyrinth was shown by dark green colour and perilymphatic space was shown by light green colour. Fig. 393. Схема распространения звуковой волны (показано стрелками) в наружном; среднем и внутреннем ухе. 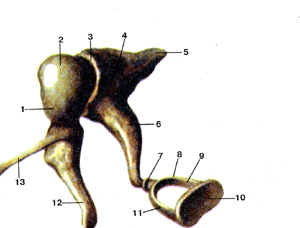 l-membrana tympani; 2-malleus; 3-incus; 4-stapes; 5-fenestra rotun-dum; 6-scala tympani; 7-ductus cochlearis; 8-scala vestibuli. Fig. 393. 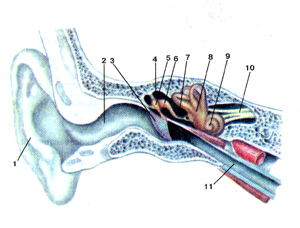 The scheme of the course of a sound wave (was shown by arrows) in external, middle and internal lars.1-tympanic membrane; 2-malleus; 3-incus; 4-stapes; 5-round window; 6-scala tympany; 7-cochlear duct; 8-scala vestibuli.